Virtual reality is sweeping across the football scene, on both the college level and in the NFL. 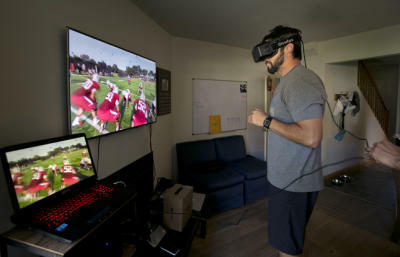 Jeremy Bailenson, a Stanford professor and a leader in virtual reality, worked with former Stanford QB Trent Edwards and former Stanford kicker Derek Belch to create a virtual environment to help train football players. The environment created makes it feel like the player is at a practice. While no passes are actually thrown during the simulation, there's still a lot this simulation has to offer. Coaches look at it as their playbook brought to life. Players can use the software to stand among complex schemes that they'd normally only see on game days. Quarterbacks especially can get better reading defenses. Backup players can take rep repetitions without playing time. And--especially in college football , where teams can only have so many contact hours--it's a way to help minimize contact. The simulation can also help simulate noise, which is one of the reasons the 49ers bought it, since they have to play a game in Seattle every year. Plus, since the software was made by two former football players, it simulates things no other simulation does. For example, a player dropping their mouth guard. It's not much, but that player has to go back, pick it up, and put it back in. That kind of slip up happens occasionally, and can affect the offense's rhythm. A quarterback normally only sees this during games, but now they have the chance to practice handling it. The 49ers, Cowboys, Jets, Cardinals, Saints, and Vikings have all signed on to use the software. The Buccaneers have started using a competing virtual-reality system. In the NCAA, Arkansas, Auburn, Clemson, Dartmouth, Georgetown, Rice, Stanford, and Vanderbilt are among the teams who signed on to use it. Marriott is working to bring virtual reality into their hotels. In an attempt to appeal more to millennials, Marriott has begun testing the idea of "VRoom Service" in their New York Marriott Marquis and London Marriott Park Lane locations. This program allows guests to order a Samsung Gear VR headset brought up to their room for twenty-four hours. The devices run on Samsung's Milk VR platform, and come pre-loaded with three videos. The videos, which Marriott calls "VR postcards," allow guests to travel with someone else (who the video is narrated by) through Chile, Beijing, and Rwanda. The videos are presented in full 360 3D, to give guests the feeling of actually traveling to these places without ever leaving the comfort of their hotel rooms. The hotel chain tried something similar before at their New York location, where they had a virtual reality booth that surrounded people in a 360-degree immersive trip to a beach in Hawaii. The "VRoom Service" is, in a way, a sequel to that idea. If this program is successful, it will likely be rolled out to a few other locations. There are some architects that create virtual models of their building plans so that people can walk through the structure before the foundation is even laid. Clients are able to move around exteriors and interiors, ask questions, and even suggest alterations to the design. Virtual models can give a much more accurate idea of how moving through a building will feel than a miniature model. Car companies have used virtual reality technology to build virtual prototypes of new vehicles, and test them thoroughly before producing a single physical part. Designers are able to make alterations without having to scarp the entire model, as they often would with physical ones. As a result, the development process becomes more efficient and less expensive. The military and the space program use virtual environments in the training process. For a while now, the military has been a strong supporter of virtual reality technology and development. Training programs can include everything from squad combat to to vehicle simulations. Overall, virtual reality systems are much safer and, in the long run, less expensive than alternative training methods. Soldiers who have gone through extensive virtual reality training have proven to be as effective as those who train under traditional conditions. Virtual reality is also useful to medical students. Staff are able to use virtual environments to train in everything from surgical procedures to diagnosing a patient. In addition to using virtual reality technology to train and educate, surgeons have used the technology to perform surgery remotely by using robotic devices. The first robotic surgery was performed in a Paris hospital in 1998. These systems, like most virtual reality systems, still deal with potential problems of latency. These systems also need to provide finely-tuned sensory feedback to the surgeon. Surgery isn't the only use for virtual reality technology in the medical field. Virtual environments have been used in psychological therapy, especially in treating people with phobias and other psychological condition. The virtual environment acts as exposure therapy, where the patient can be exposed in controlled conditions to stimuli that cause them distress. There are two main advantages to this over real exposure therapy: it is a lot more convenient, and patients are more willing to try this therapy because they know it isn't the real world. Research in these practices have led to the founding of the company Virtually Better, which sells virtual reality therapy systems to doctors in fourteen countries. is a more reliable form of conveying meaning, since it allows us to actually show others what we mean. them, and extend when forces are pulling on them” (The Nano Age). Scientists have also begun exploring the possibility of developing biosensors for use in virtual reality. A biosensor is able to detect and interpret nerve and muscle activity. When a biosensor is properly calibrated, a computer will be able to interpret how a user is moving in physical space and will be able to translate that into the corresponding motions in virtual space. Biosensors can be attached directly to the skin of a user, or they can be incorporated into gloves or bodysuits. The biggest limitation right now to biosensor usage is that they need to custom made for each user or the sensors will not line up properly on the user's body.